Sorry we have not done this sooner. 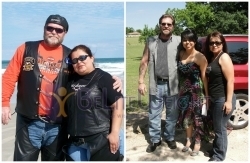 The before picture was taken in February 09 at Daytona Beach ….3 months before the surgery. I was weighing 300lbs and Belinda was weighing 233. The after picture was taken May 29th almost exactly one year after the surgery. I now weigh 235 and Belinda weighs 155*. A combined weight loss of 143*. Mine has all but stopped….i probably could have kept it going but I didn't want to get below 225 so the last 10 lbs will be up to me. Belinda continues to lose just at a slower rate. We are both very pleased. I no longer am on any diabetes medication. My last A1C was in the low 6's. And I now take only one little 5mg Rampiril for my blood pressure and that is due more to work than weight...ha. We answer everyone that ask and let them all know to GO FOR IT. We truly appreciate everything you helped us with Joanne. And truly, truly appreciate Dr. Rod and Dr.Calderon for making it as affordable as he did. Please give him our sincere thanks also.